When men hit the age of 30, they may begin to notice unwanted whiskers protruding from their nose. As you begin to age, your nose hairs will become thicker. This can be very embarrassing, making you self-conscious when out in public. Nose hairs are something that mother nature intended to prevent dirt from entering into our nose. However, if you are not happy with your nose hairs, and want them removed, you can do so without any worries. When trimming nose hairs, safety is the most important thing to keep in mind. By using certain precautions, you can safely do this. Clean your nose. 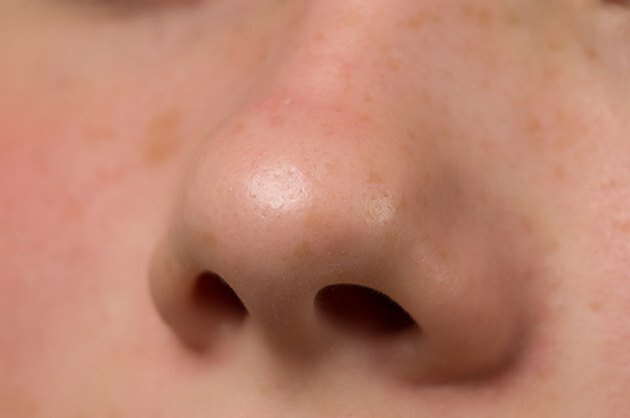 Before removing nose hairs, make sure your nostrils are clean for easier removal. It is difficult to trim hairs that are hard or stuck together with dirt. At this time, you should also separate any nose hairs that you have with a damp cloth. Remove your nose hairs in a well-lit area. For the safest removal, it is important that you have the proper lighting to be sure that you can clearly see what you are trimming. This will greatly reduce the chance of hurting yourself. Stand in front of a magnifying mirror. This will give you a close-up view of the area you are trimming, reducing the chance of injury, and make trimming a much easier task. Tilt your head back and lift your nostril. This will give you a better view so that you trim the right amount of hair off. Turn on the nose hair trimmers and insert into nostril. Start by trimming those hairs that are sticking out of your nose first, and then work your way in. Do not over-trim. You don't have to try and get rid of all of your nose hairs, simply remove those hairs that are sticking out of your nostrils. Select quality nose hair trimmers. Always clean your nose hair trimmers after each use to reduce the spread of germs. Never use sharp objects such as scissors to trim your nose hairs. Not only can they cause pain and irritation, but they can be very dangerous, causing you to permanently scar yourself with just a small, accidental jerk. Avoid using tweezers. They hurt and can lead to an infection. How Do Women Get Rid of the Hair in Their Nose?